SUMMARY: Synovial sarcoma is the third most common histologic type of extremity soft tissue sarcoma. However, primary retropharyngeal synovial sarcoma is extremely rare. 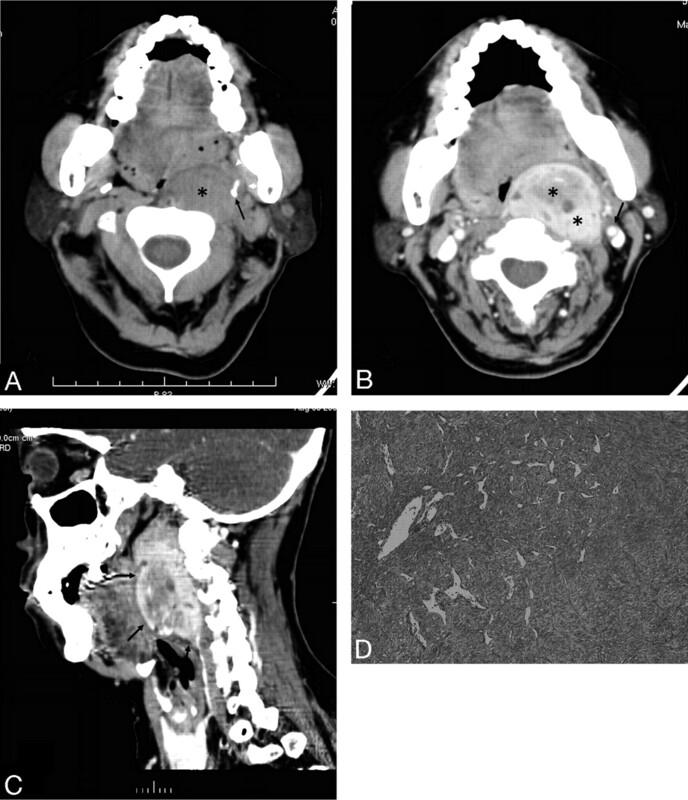 We present a case of primary retropharyngeal synovial sarcoma in a 60-year-old woman. The radiographic imaging of our present cases was characteristic of a heterogeneously enhancing mass. Synovial sarcoma, a mesenchymal spindle-cell tumor, arises most commonly in the deep soft tissues of the extremities (especially around the knee), and frequently adjacent to the joints or tendon sheaths. The retropharyngeal space is a rare site for this tumor. We describe a case of synovial sarcoma located in the retropharyngeal space, focusing on the CT imaging findings. In August 2006, a 60-year-old woman with difficulties in swallowing and nausea for 3 months was referred to our hospital for evaluation. A clinical examination revealed a submucosal bulging of the left posterior pharyngeal wall. The overlying mucosa seemed to be hypervascular but was not ulcerated. There were no pathologic lymph nodes in the neck. CT scans of the head and neck showed a large, well-circumscribed, solid mass in the left retropharyngeal space, which was isoattenuated to the muscle (Fig 1A). The styloid process was anterolaterally displaced by the mass. After infusion of the contrast material, the mass showed strong heterogeneous enhancement (Fig 1B). The mass displaced the parapharyngeal fat anteriorly, pharyngeal mucosal space medially, and internal carotid artery laterally. A multiplanar reformatted image showed a clearly limited oval mass in the retropharyngeal space extending from the first to the fifth vertebrae (Fig 1C). A 60-year-old woman with a bulging mass in the left retropharyngeal space. A, Axial CT scan shows a large, well-circumscribed, solid mass in the left retropharyngeal space (black asterisk). The mass displaces the parapharyngeal fat anteriorly (white arrowheads). Note the styloid process, which is anterolaterally displaced by the mass (black arrow). B, Contrast-enhanced axial CT scan shows a well-marginated strong heterogeneous enhancement mass in the left retropharyngeal space (black asterisks). The mass displaces the parapharyngeal fat anteriorly, the pharyngeal mucosal space medially, and the internal carotid artery laterally (black arrow). C, A multiplanar reformatted image shows a clearly limited oval mass in the retropharyngeal space extending from the first to the fifth vertebrae (black arrows). D, Low-power photomicrograph (original magnification, ×20) reveals a proliferation of oval to spindle-shaped cells arranged in sheets and fascicles. The patient underwent a left cervicotomy, in which the lesion was enucleated. During surgery, the tumor appeared tan, circumscribed, and adherent to the anterior common vertebral ligament. The gross specimen, measuring 5.0 × 3.5 × 6.0 cm, was encapsulated. The histologic examination revealed a proliferation of oval to spindle-shaped cells arranged in sheets and fascicles (Fig 1D). On immunohistochemical analysis, tumor cells were positive for keratins, vimentin, and epithelial membrane antigen, and negative for S-100, desmin. The histologic diagnosis was monophasic synovial sarcoma. Two years after initial surgery, the patient is free of disease, without signs of local recurrence and distant metastases, and functioning adequately. Synovial sarcoma is a mesenchymal spindle-cell tumor that displays variable epithelial differentiation including glandular formation and has a specific chromosomal translocation t(X; 18) (p11; q11). Synovial sarcoma accounts for 5% to 10% of soft tissue sarcomas.1 The reported annual incidence is 2.57 per 100,000.2 They are reported from birth to age 89 years but occur mainly between the ages of 15 and 40 years3 and are more common in males. Synovial sarcoma is unrelated to the synovium, and less than 5% of these sarcomas originate within a joint or bursa. More than 80% of these tumors arise in the deep soft tissue of the extremities (especially around the knee), and the tumor frequently arises adjacent to joints or tendon sheaths. Approximately 5% of these tumors arise in the head and neck region; however, any site can be affected.4,5 In the case of our patient, the tumor was located within the left suprahyoid portion of the retropharyngeal space. The most common radiologic finding of primary synovial sarcoma has been described to be a heterogeneously enhancing soft tissue mass, with well-defined margins and without calcifications on CT.6 In the case of our patient, the tumor concurred with previous reports. The retropharyngeal space is a distinct space along the midline of the extracranial portion of the head and neck that extends from the skull base to the upper mediastinum. It is bounded by the middle and deep layers of the deep cervical fascia. Lymph nodes and fat are found in the suprahyoid portion of the retropharyngeal space, whereas only fat is present in the infrahyoid portion. In the case of our patient, the tumor was thought to arise from a retropharyngeal node, probably the lateral group, which is located at the anterolateral aspect of the prevertebral muscle. To the best of our knowledge, only 1 case of retropharyngeal synovial sarcoma has been reported. Radiologists should be familiar with synovial sarcoma in the different sites, and synovial sarcoma should be considered in the differential diagnosis of masses involving the retropharyngeal space.